The TPS380x family of Supervisory Circuits monitor supply voltages to provide circuit initialization and Timing supervision, primarily for DSPs and other processor-based systems. This is one package pinout of TPS3800G27,If you need more pinouts please download TPS3800G27's pdf datasheet. 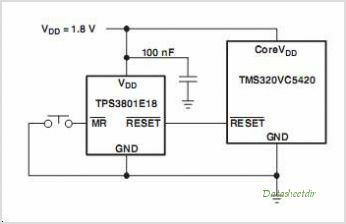 This is one application circuit of TPS3800G27,If you need more circuits,please download TPS3800G27's pdf datasheet.